REMO ZWICK, product manager, Geberit International Sales – Dubai Branch, touches upon issues of green building and acoustic installations with regard to sanitary systems. A sustainable building is the result of a fundamental decision to protect the environment, and the sanitary technology utilised in it has to be able to uncompromisingly and comprehensively support this decision. Under no circumstances should it bring about situations that hinder the building owner’s ambitious goals or add needless expense to it. More and more private, institutional and public building owners are now realising that sustainable construction pays off. In the sanitary and piping sector, Geberit’s perfectly conceived installations provide a system technology that pays off! With a complete and perfectly coordinated range of installation systems, the Switzerland-headquartered multinational company offers customised solutions for every conceivable construction situation. Whether building sanitary prewalls and partition walls in lightweight construction projects or installing sanitary systems in solid construction projects, the system technology from Geberit always creates the perfect prerequisites. It guarantees maximum comfort, freedom as to where the sanitary appliances can be positioned and rapid construction progress. Furthermore, it also complies with all current fire protection and sound insulation requirements. This ensures that planners and plumbers do not have to make any compromises that could turn out to be unfavourable by as early as the medium term. Just how sustainable a building really is usually only becomes clear when it is occupied and used. As demonstrated time and again, well-conceived system solutions that may perhaps be more expensive initially can prove considerably less expensive when the entire service life of a building is taken into consideration. Each time sanitary installations are subsequently adapted or added to, it pays to have opted for the proven system technology from Geberit right from the outset. Intelligent and effective sound insulation solutions featuring Geberit system technology make a sustainable improvement to people’s quality of life. • Reducing structure-borne sound transmission by decoupling of pipes from the building structure; using elastic fastenings for sanitary appliances; solid-borne sound insulation between the pipe and building; and certified prewall installations. One of the key advantages of using Geberit products for sustainable construction is the support network provided on the ground. The market appreciates Geberit products and the service it provides. Its network of technical consultants ensures architects, consultants and MEP (mechanical, electrical and plumbing) contractors have the correct answers and solutions to queries and problems in the sanitary technology realm. One of my tasks as product manager for the Gulf regional office is to oversee the training programmes offered by Geberit’s network of consultants, that partners truly see the benefit of selecting Geberit products for their ease of installation, easy maintenance and understand that they have a long life cycle. Geberit focuses on training and in the region has staff on the ground across the GCC to ensure that when it supplies to a project, they are there to assist with training the installers on site. In addition, Geberit spare parts are available for a long time – some for a 25-year period even after product lines are discontinued. Geberit has devoted itself to developing sustainable products of the highest of standards, providing innovative system solutions for green construction. It offers a range of products that are regarded as sustainable sanitation solutions and which contribute to increased quality of life with low energy and water consumption and using ecologically-friendly materials. Noise insulation or simple product disposal are also part of responsible product design. Its branded products are innovative, durable and eco-efficient, being exemplary in terms of water and energy consumption and sound insulation. The range of products facilitates the implementation of green building and the fulfilment of standards such as Estidama of Abu Dhabi, UAE, Minergie of Switzerland and Leed (Leadership in Energy and Environmental Design) of the US. Geberit models are water efficient. Geberit has in-depth expertise in the areas of water conservation, drinking water quality and acoustics. The company continuously sets new standards with its thorough ‘Eco-design’, offering products that combine reliability, design and sustainability. The approach minimises water and energy consumption and environmental impact across the entire product lifecycle and provides the foundation for sustainable construction. It applies the eco-design testing criterion to all products in development to align them with the principles of sustainability and for the entire product lifecycle. Geberit regards eco-design as the key to environment-friendly products and key to these efforts are environment-friendly materials and functional principles, minimised risks and a high level of resource efficiency in the production process and the product itself. Employees from various disciplines take part in eco-design workshops in order to make each new product better than its predecessor with respect to environmental aspects. These workshops include a systematic product analysis across all life phases, verification of statutory requirements as well as an analysis of competitors’ products. Solution approaches are developed on the basis of the eco-design workshops and are included in the specifications. A great deal of water can be saved in both private and public facilities with modern sanitary technology. However, it is difficult to determine how economical a given product really is at first glance. The WELL label, (Water Efficiency Label) was developed as a solution to this problem. The classification system, which provides instant information on the water efficiency of a product, was developed by the European umbrella organisation of the sanitary valve industry and a number of well-known manufacturers – including Geberit. In addition to the central aspect – namely water consumption – aspects such as hygiene and the number of flushing programmes (with toilet flush systems and urinals) or temperature limitation and sensor control (with lavatory faucets and shower fittings) are also considered and assessed depending on the product category. 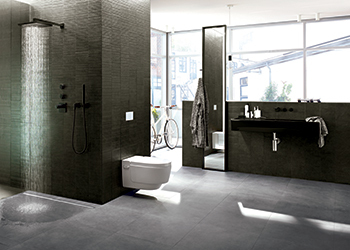 Geberit intends to have all products that are relevant for European markets classified according to the WELL system. 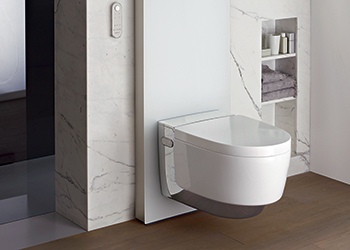 Geberit products that have already been classified have consistently achieved top ratings.